I have a printer that requires me to manually level the bedplate with the support screws under the bedplate. I had to do this once before, and it took me quite a while to get all 4 corners and bedplate levelled. I estimated in the end, and it worked fine, but my bedplate is no longer levelled again. Any tips for easier levelling? I have a Level tool, but it’s almost impossible to hand crank it so that it’s levelled everywhere. Which printer, and model, do you have ? Which slicer/controller program are you using ? “Leveling” is more of a generic term, than what you are actually trying to accomplish. Specifically, you are creating an “equally spaced” horizontal plane, between the gantry(nozzle tip), and the bed surface. Use your controller program, you want to “home” the Z-axis(nozzle to bed). Move the nozzle to all 4 corners, and adjust the screws, so that the “gap” between the nozzle and the bed, is just enough so the paper has just a very-slight drag(resistance) in the space. Repeat moving around to all 4 corners to double check for consistent “gap” spacing. Paper is 0.1mm thick, this is half of the typical 0.2mm layer height. 50-75% of a chosen “layer height” is the perfect “gap” spacing to achieve 1st layer bonding. Just add a few “skirt” lines around your print object, and make those adjustments, before object starts printing. You could also just use a calibration test print, “circle/spiral”, to achieve the same result, if you are not comfortable(or quick enough) , to do it with a printed object. Thank you all. It is a self built printer. I don’t have a program to help me level the plate. I am trying to get the paper to be levelled, but when I get it at a good level for 2 of the sides, or maybe sometimes one, the other sides aren’t levelled. I will maybe try the method to start a print then level. But quick question, if I bump the print with the nozzle accidentally during this process, will this damage it? Every printer has a USB connection plug, that receives X,Y,Z-axis control commands, and gcode print instructions, from a controller/slicer program. That program does not help you level the plate (directly), it only moves the nozzle around , so you can manually make adjustments to the bed. http://www.thingiverse.com/thing:630655/#files This is a ONE layer test. Choose the “spiral test file” that fits the size of your bed. (75% of bed size will be fine). Watch for a good/consistent “squish”, of the filament, to the bed plate. Once you understand what you are trying to accomplish with this test, then you will be more comfortable just using skirts around your normal print objects, just to double-check your bed for level, before the actual print starts. You will never/can’t bump the print, because the adjustments are made on the 1st layer, before the print ever starts. As an additional note: Since you mentioned this is a self built printer, please use a square, and make sure that your machine is square, in all directions. If it is not, you will never get the bed “ON AN EQUAL PLANE WITH THE X and Y GANTRY(s)” / (level). A printer can print on it’s side, or upside-down, as long as everything is “square”, and the bed is on an “equal horizontal plane”, with the nozzle. Another option you may want to look into is something along these lines. You can either remove your tool head and put in a 3d printed bracket and the dial indicator and level your bed then. Or build a bracket to come off your tool head and hold the dial indicator for leveling and remove for the print. I really like the spiral design for bedplate levelling. @Chris_Halliday Sorry, I am unfamiliar with the dial indicator. What does it do? What is it measuring? 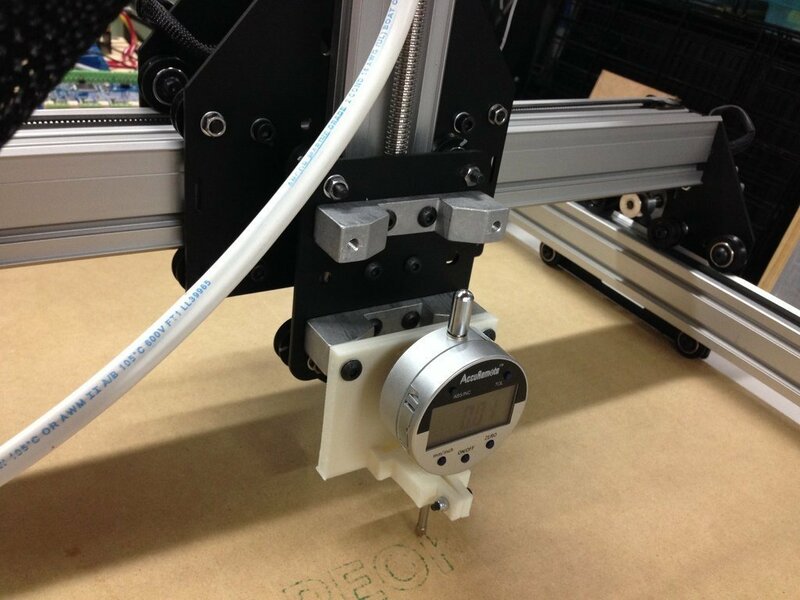 The dial indicator is measuring your Z axis distance from the probe to the bed. By moving the probe in the X/Y directions you will be able to see that the probe is either further or closer to the bed showing which corners need to be either raised or lowered. First off, always level your bed with you printer heated up for the material you are using. I need to relevel when switching from PLA to ABS because of the different bed temp. Now with the printer homed, then centered, slide a piece of fresh printer paper flat under your nozzle. You should feel a slight amount of drag when you jiggle the paper. Adjust the thumb screws until you do. Keep turning the screws and moving the paper. Start in the center then go diagonally from corner to corner (by jogging your nozzle, from utilities menu or from PC). Turn the screws until you feel heavy drag then back off a tad. I do it with my fan running and I can feel the vibration through the paper. From the amount of vibration and drag you can easily tell which way the bed needs to go. You’ll need to go around the bed two or three times to make sure, because moving a screw in one corner will impact the others. Eventually you’ll zero in on level. This is by far the fastest and best method I have found. This is something new and I recently pledged for this new device called ultrasonic alignment tool for 3D Printers, Its an external device that can be connected to USB or bluetooth and works on any printers. I think this is pretty kool deal for the price asked for … I am excited for it tp arrive at my garage… you guys should check it out and let’s discuss its pros and cons… The project is still on , here is the link. Introducing Vision4print is an leading print media company in the Birmingham. We the vision4print print business cards, cheap flyers printing, leaflets, labels, stickers, posters, banners, signage, banners, booklet printing. 24/7 customer support with free delivery. Affordable price that easily cover all your need. I am Ally Shaw, from vegaprint Cardiff UK - Providing high quality printing solution for your brand promotion.